The International Court of Justice has ruled that Israel's West Bank barrier is illegal and construction of it should be stopped immediately. The ruling said the barrier's construction was "tantamount to annexation" and impeded the Palestinian right to self-determination. Israel insists the barrier is needed to keep out West Bank militants. The Palestinians consider it a land grab. The court's decision is not binding, but can serve as a basis for UN action. Palestinian leader Yasser Arafat hailed the ruling as a "victory for the Palestinian people". 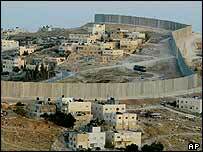 "We salute this decision condemning the racist wall," Mr Arafat told reporters at his West Bank headquarters. Israel has said it will not accept the non-binding judgement, and that the barrier has already served its stated purpose by preventing suicide bomb attacks. "I believe that after all the rancour dies, this resolution will find its place in the garbage can of history," said Raanan Gissin, a senior aide to Israeli Prime Minister Ariel Sharon. "The court has made an unjust ruling denying Israel its right of self-defence." The court in The Hague unanimously rejected Israel's argument that it has no right to rule on the legality of the barrier. Several countries, including the US and UK, had argued the court should stay out of the issue, warning that any opinion it gives could interfere with the Middle East peace process. "We do not believe that that's the appropriate forum to resolve what is a political issue," said White House spokesman Scott McClellan. The ICJ began issuing its ruling at 1300GMT - the reading lasted about two hours. Reading the ruling, Court President Shi Jiuyong of China said the court was not convinced the barrier's construction was the only means to achieve Israel's aim of protecting its people from suicide attacks. The construction of the wall created a fait accompli which could become permanent, it added. "It would be tantamount to de facto annexation," Mr Shi said. "That construction, along with measures previously taken, thus severely impeded the exercise by the Palestinian people of its right to self-determination." The current route of the barrier cannot be justified for military needs, he added. the UN should consider what further action to take. One of the 15 members of the court, US Judge Thomas Buergenthal, dissented from all of the above findings. "They want us out of this area so that when the settlers come they will have peace." The court has spent five months considering the issue of the barrier at the request of the UN General Assembly. BBC diplomatic correspondent Jonathan Marcus says the real question is what, if anything, will change now that the barrier has been declared illegal. Arab governments are likely to seek an emergency session of the UN General Assembly to try to secure a resolution endorsing the court's decision. But experts caution against any expectation of tough UN action - not least because of the US veto in the Security Council. Much of the 640km (400-mile) barrier, started in 2002, is being built on territory Israel occupied in 1967, rather than along the internationally recognised boundary between Israel and the West Bank. Palestinians say the network of walls, fences and ditches is taking away their land and dividing their communities, separating people from schools or workplaces. "This is the first international legal test for the barrier"